Tapestry cushions add colour, texture and pattern to a room's decor. Cushions on sofas and arm chairs are essential to create a comfortable place in which to relax. 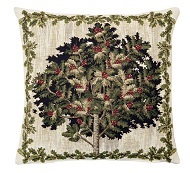 Tapestry cushions create a complete look with a wall-hanging tapestry. If you know what cushion design or theme you are looking for, use the “cushion category” list on the left hand size of your page now to fine tune your search. 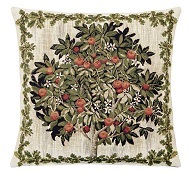 Tapestry cushions are supplied with a velvet backing, a zipper at the bottom and a fibre-filled insert. Cushions can be shipped with or without inserts. For customers who wish to customize their cushion make-up, large and medium cushions are available without backing, ready to be made up as you like. These are referred to as unfinished. An unfinished panel is also suitable for picture framing and making up into a firescreen or a footstool. Classic Tapestries also offers a textile framing service, firescreen make up service and footstool upholstery service. We welcome enquiries. Examples of framed panels made up firescreens and upholstered footstools and chair seats can be viewed at our premises or images can be sent via email. Note: Some medium and small cushions may feature a slightly simplified design from the large cushions. Beautiful Italian tapestries are available for purchase at Classic Tapestries. Contact us for more designs. This cushion design is from the "La Manta" tapestry circa 1420. Tapestry can be found on this website. This cushion design is from the Italian tapestry "La Manta". This tapestry is available for viewing on this website.